"The first thing I thought was 'how wonderful' what nature can create... Then afterwards I felt a huge thump and I thought the situation was getting dangerous." An enormous waterspout has been captured on film moving from the sea and hitting the Italian city of Salerno. The rare phenomenon enthralled locals, many of whom described the waterspout as 'spectacular' while sharing pics on social media. According to ABC News, waterspouts are similar to tornadoes, but form over water when cool and unstable air passes over warmer waters and turns into a spinning column of water. They tend to collapse once they move across solid ground. Videos and photos by eyewitnesses show the waterspout moving closer to land two days ago. Antonio Stanzione, who shared a video of the waterspout, captured in the nearby coastal town of Vietri Sul Mare, said he had "never seen such a scene." "The first thing I thought was 'how wonderful' what nature can create," Mr Stanzione told Euronews, "Then afterwards I felt a huge thump and I thought the situation was getting dangerous." However, no injuries were reported. 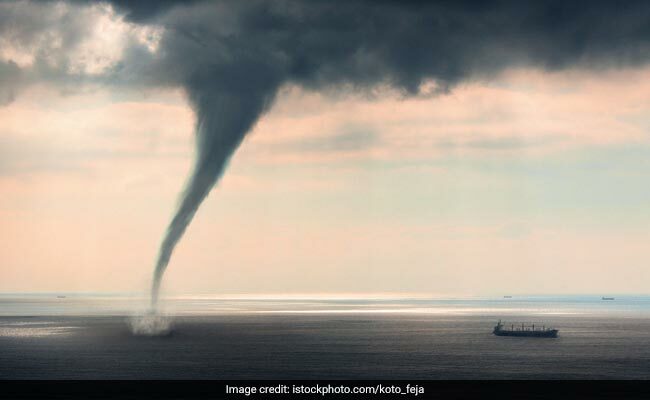 According to local reports, the waterspout broke the mooring ropes of a ship and upturned many cargo containers, but no significant damage was reported. Last year in December, a waterspout that turned into a tornado on land lashed the coastal city of Sanremo in Italy.